Over the next year and a half, we’ll be theorizing about how the lead characters in the latest Star Wars trilogy might end up once J.J. Abrams brings this exciting new story to a close. So far we’ve looked at the villainous Kylo Ren, ace Resistance pilot Poe Dameron and the heroic Finn . Now let’s turn our attention to the sinister General Armitage Hux and see where he might find himself come the series’ end. There’s no path really more obvious in the new line up of Star Wars characters than that of General Armitage Hux. The fact that it is of his own doing is really the only fascinating part of his story. Definitely a “true believer”, Hux was born and bred to be a part of the First Order and their doctrine having been the offspring of Brendol Hux, the man largely responsible for it. Much like the Empire before, the First Order employs the strictest of rules and regulations all with the objective of creating the most loyal and obedient servants from birth, and Hux is a direct product of those philosophies and trainings. While Hux’s birth wasn’t planned and his father generally had a low opinion of his resilience and grit, he nevertheless was groomed for leadership within the ranks of the cadet corps at an early age. He quickly rose and became ever the opportunist seizing higher ranks and advancements as the opportunities afforded themselves. As luck would have it, his father Brendol would meet the person responsible for his death when he crashed on the home planet of future First Order Captain, Phasma. This encounter would bring the Parnassosian into Armitage's life and give him the wherewithal he needed to take command. Recognizing in each other the same desire for order and power, Armitage and Phasma formed a sinister partnership the product of which would be to plan and carry out the murder of his father, Brendol Hux. Immediately after Armitage assumed leadership of the First Order, which was his plan all along, and he’s been commanding the fleet ever since. Like I said, there’s almost no chance Hux doesn’t die at the end of Episode IX when it comes out next year. Much like Governor Arihnda Pryce who went down with the Imperial Complex on Lothal, remaining a loyal servant of the Empire to the end, Hux will most assuredly go down with whatever ship he happens to be in command of. It’s in his DNA to do so. "You wonder why I keep a rabid cur in such a place of power. A cur's weakness, properly manipulated, can be a sharp tool." Whether he assumes full control of the First Order by the time Episode IX is under way is a different matter. Kylo Ren had taken over the role of “Supreme Leader” by the end of The Last Jedi with Hux begrudgingly swearing his allegiance to him. But don’t think the slightest waiver by Ren won’t keep Hux from seizing any opportunity to lead; after all, this man had his own father murdered. 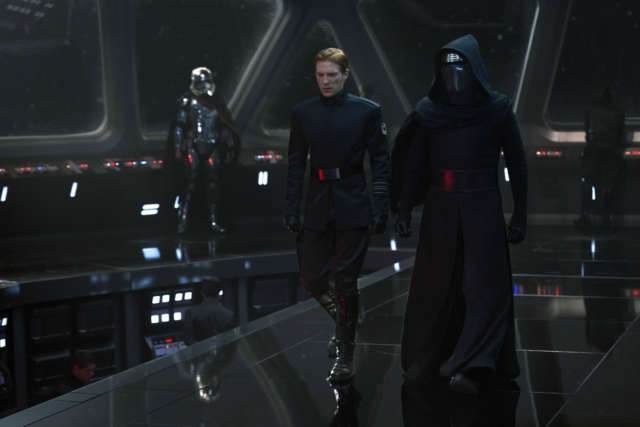 With a rumored time jump and Ren potentially off in pursuit of Rey and other younger Jedi, Hux could easily take advantage of his absentmindedness and sneak onto the throne. Or perhaps Kylo has an about face and a change of heart which would then leave Hux in command by default. He’s true blue regulations and pomp and leaves time in his life for little else including personal relationships. Outside of his father, Brendol, Armitage only had two somewhat important interactions in his life. One was with Commander Rae Sloane, who travelled with him to the Unknown Regions after the Battle of Jakku. The second was Gallius Rax who was the final Fleet Admiral of the Imperial Navy before he was killed on Jakku by a vengeful and power hungry Sloane. Both took pity on him as a boy, mostly due to the abuse inflicted on him by his father, and went out of their way to see that he succeeded. They both saw in him the potential to be a great leader in this new regime they were starting, something his father did not. But Rax as I mentioned is dead and Sloane’s whereabouts are unknown but with her being somewhere around the age of 75, she’s likely either dead or retired. As I mentioned he did form somewhat of a partnership with Captain Phasma, but that union was built on deception, betrayal and murder, not what normal people would call a healthy relationship. Besides, it appears she met her demise at the hands of Finn on board the Supremacy at the end of The Last Jedi so he is very much alone at this point. So these somewhat malformed familial ties aren’t providing much help when trying to determine what a slim, but possible future may look like for Hux. No, I believe our dear old Armitage will see the end of his somewhat sad existence and rightfully so. He did order the destruction of millions and millions of lives on Hosnian Prime and other planets when he fired the Starkiller Base weapon into that system. What does everybody think; will Hux survive to see the end of Episode IX next year? If he lives will he spend of the rest of his life in hiding or prison?